Northern Saskatchewan has a population that is 80% Cree, Dene and Metis. Northern communities maintain a strong relationship with the lands, rivers and lakes of the boreal forest we call home. The lands and water are intrinsically tied to the physical, emotional and spiritual wellbeing of the people. Since the inception of the colonial institution called Saskatchewan, the Original People have faced trauma through the decimation of the population from diseases introduced by fur traders, the kidnapping, abuse and indoctrination through residential schools, and the continuous theft of lands and resources through the shady legislation, the NRTA (Natural Resources Transfer Act) in 1930. Every single community has been left with intergenerational issues that have not been addressed. When the government of Canada gave away the lands and resources to the province of Saskatchewan without the agreement or even consultation of the Cree and Dene Treaty partners, they intentionally set up the process to force the Original People of the north to lose their autonomy. This is ongoing, as the Indigenous people are pushed into dependence on the ‘Boom and Bust’ resource extraction economy, which decimates the lands and waters. The provinces designated the north as ‘Open for Sale’, and northerners whose cultural values of taking care of the land in the best interests of the next seven generations, are becoming ever more stressed, as they see once pristine waters becoming contaminated. Industrial development is scarring the lands, erasing ancestral presence and making some places permanent sacrifice zones. We are the fastest-growing population in the province. Northerners are intentionally kept on the edge of poverty due to inequitable opportunities and spending rendered on the part of both the provincial and federal governments. Jurisdictional issues further confuse and divide services. Yet, billions of dollars worth of resource commodities are remove from our homelands annually. Forests are literally disappearing down the road, while every northern community has a shortage of adequate housing. We observe how the province has turned a blind eye to corporations like Cameco, which for years has avoided paying billions of dollars in taxes. The time is long past due for the knowledge of Cree, Dene and Metis land users of the limitations of living systems on their lands, to over rule that of governments. The influx of industrial development and resource extraction is taking a heavy toll. This is having a global impact. These ecosystems contain a great portion of the world’s fresh water. The trees and muskegs are a living part of that. They also provide the key to carbon capture if left intact. People who live close to the land notice the extreme changes in climate. Indicators from the plant and animal world are no longer able to predict the weather. Eons of traditional science knowledge has been rendered useless by climate change within the last two decades. As climate change progresses, extremes are going to have an increasing impact. The Saskatchewan government has failed repeatedly to respect the Original People’s knowledge in the consultation process on resource development projects. The government approves exploration and Environment Impact Assessments on Indigenous lands, regardless of and prior to, consent or concern on the impacts this has on the Dene, Cree and Metis land use. When northern people say “No” to these projects, we are looking long term, beyond the economic trade deals. We have a duty to look after land, air and water for the benefit of all future generations. The federal government has embarked on studying the concept of a Northern Corridor, which would be a several kilometer wide cleared swath running seven thousand kilometers across northern Canada. In Saskatchewan, it is proposed to begin one hundred kilometers north of La Loche in the northwest, through the Athabasca Basin and splitting north towards the Port of Churchill and east to northern Manitoba. It would include a highway, rail line, pipelines, electrical transmission lines and telecommunication lines. The authors of the proposal, the University of Calgary School of Public Policy, claim this would lower the cost of groceries for northern residents. They also claim this would leave the lightest environmental footprint, while cutting the cost of northern development. The Northern Corridor is, in reality, a thinly-veiled plan for cutting the cost for corporations to move the resources they extract from our north to ports to the international markets. It would open the north to exploitation and increase the environmental impacts as more resource extraction would seize the opportunity. The authors suggest that legislation be enacted to enable the entire project to be subject to only ONE environmental impact assessment, over all jurisdictions nationally to fast track its completion. Part of the purpose of the Northern Corridor is to free the southern transportation system in the heavily populated south from being put at risk by using the northern route as the Dangerous Goods Route. This corridor would be totally disruptive to a highly sensitive landscape. The prospect of rail cars, vehicle traffic, and pipelines carrying hazardous materials across thousands of rivers, lakes and muskegs is an environmental nightmare in the making, 3 especially with the weak safety records and minimal cleanup response already evident in this province and country. This is another made in the south project, which has been hinted at by the Saskatchewan Chamber of Commerce, with little to no input from the Indigenous people whose lands are being targeted. This colonial patronizing viewpoint offers little but further exploitation. In order to get around the indisputable truth that the provinces do not own these lands, the policy designers are suggesting that Indigenous peoples be enticed to partner in to the hundred billion dollar project. Considering all of the issues that have been imposed on Indigenous people, the impacts, both socioeconomic and environmental, would greatly exacerbate the problems. Indigenous people must have final authority, as actual true stewards, over what development takes place on their lands and waters, and have the authority to regulate it. Northerners need to develop community and regionals plans, and have those plans respected and supported by the province. Corporate interests have no place, and should not be allowed to influence, the current and future Indigenous leaders to override their people’s values, interests and government systems, with corporate governance programs, such as they have at the University of Saskatchewan, in the Cameco-sponsored Aboriginal Governance and Northern Development. Our province’s name is Cree, meaning swift-flowing water. Saskatchewan could champion renewable energy by harnessing the abundant kinetic energy of our rivers, the winds, as well as that readily available in our long hours of sunlight. With the effects of climate change already manifesting themselves worldwide, including in the northern Boreal forests where sparse precipitation has contributed to unprecedented wildfires, maintaining a fossil fuel energy course is both morally and financially irresponsible. It is imperative that all building codes be immediately revised to implement energy efficient designs and practices, such as passive hausing and the use of solar panels. At the same time, we must denounce the uranium industry’s (and the current provincial government’s) attempt to sell nuclear energy as the “green solution” to the fossil fuel dilemma. Besides contributing significantly to fossil fuel emissions throughout the entire fuel chain, the undeniable fact remains that the byproduct of nuclear energy is, in comparison, by far the most extremely hazardous and long-lasting threat to life on the planet, extending into millions of years. As is the case with most fuel industries, much of the raw product lies buried in traditional Indigenous lands. Companies including Cenovus and Cameco have targeting vulnerable Aboriginal administrations down to a science, resulting in highly controversial “agreements” for resource extraction signed behind closed doors. By the time the general population finds out, it is too late, and political pressure attempts to silence dissenters. Indigenous communities worldwide are also being targeted from the other end of the nuclear fuel chain, with the burial of deadly waste product on their traditional territories. The years of “site selection process” imposed by the Nuclear Waste Management Organization on the northern Saskatchewan communities of Pinehouse, English River First Nation and Creighton, served to tear those communities apart as administrations and certain “liaisons” were bribed into pushing the process through. The pain and grief of division left in NWMO’s wake in some cases may never be resolved. The nuclear waste burial was touted to be shallow to allow retrieval and reprocessing of the nuclear fission rods to extract plutonium by dissolving them in acid, creating an even deadlier byproduct. Despite a petition with over 20,000 signatures delivered to the Saskatchewan Legislature in 2012, we are still waiting for a provincial ban on the storage and transportation of nuclear waste in and through Saskatchewan. We must have a provincial energy policy that serves people as opposed to industry. Elon Musk’s advancing solar battery technology is already precipitating an energy revolution: independence from the electrical grid. In the same way, we must move to community-based energy supply, as opposed to dependence on industry – “energy sovereignty” – if you will. We need policy that weans us off fossil fuels while at the same time creating infrastructure to capture and utilize renewable energies. Mark Bigland Pritchard and Peter Prebble, in their Green Energy Plan, have already written the script for this to happen. We must have an energy policy that prohibits the bribing of vulnerable populations into sacrificing their sacred lands. 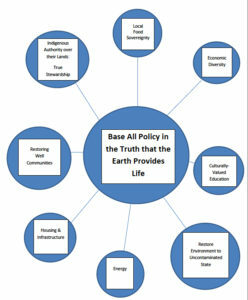 Ultimately, we need policy that is socially AND environmentally responsible, two things inseparable in the Indigenous way of knowing. It honours and protects the wellbeing of seven generations ahead. 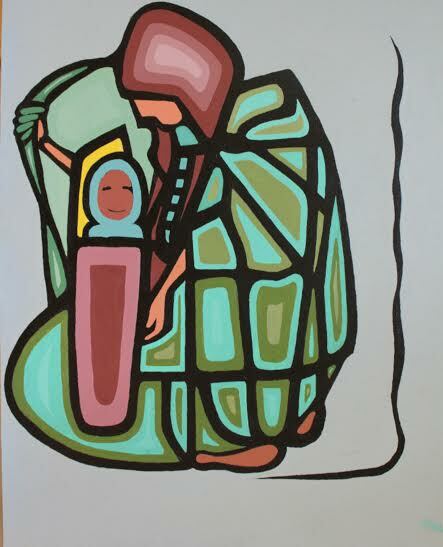 Since the inception of the colonial institution called Saskatchewan, Indigenous peoples have faced trauma through the decimation of the population from disease, kidnapping, abuse and indoctrination through residential schools, and the theft of lands and resources through the 1930 Natural Resources Transfer Agreement (NRTA) that continues to this day. The result has been intergenerational impact in every northern community, namely ongoing grief and trauma manifesting itself in family dysfunction, addictions, misdiagnosed learning disabilities and widespread mental health issues. “Indigenous” has recently become a global catchword to describe healing practices founded in earth-based spirituality. We are fortunate to still have people among us who have come about that paradigm honestly, ie directly inheriting the world view, knowledge and skills from their 5 ancestors to genuinely carry it out. However, from an Indigenous viewpoint, every person innately carries this relationship with the earth, as we simply would not exist without the life provided by it. “Wellness” therefore, is something to be restored, not learned from scratch. There are northern health professionals who have already established successful, trusted working relationships from the bottom up with youth, parents, families, communities and other professionals across the north, in Indigenous healing practices. This essentially means they are local, effective, inclusive and ongoing. They include upstream, proactive measures designed to build positive identity, confidence, dignity and leadership. However, in the present colonialized system, existing policy across a multiplicity of agencies and organizations makes possible the undermining of locally-developed services, as “proven” as they might be. Funding continues to be applied top-down – from the outside in -perpetuating ineffective practices of engagement, diagnosis, unrealistic strategies and lack of continuity. One example is the mailing of referral letters to people whose health conditions have rendered them so vulnerable as to be living on the street, pre-empting the possibility of ever receiving mail, let alone following through to attend a series of 30-minute one-on-one appointments booked in offices several hours away in the city. Yet, the fact that there’s a paper trail referring the individual to a psychiatrist, allows the lie of accountability to continue. Restoring well communities means that every individual within that community is viewed as valuable, capable and deserving of the best care possible. Although northern Saskatchewan has some of the highest rates of suicide and drug/alcohol addictions in the country, there is not one wellness center. Our population of Elders is increasing dramatically, yet our northern communities have little or no facilities which allow them to maintain quality of life close to their families, while accommodating their higher level health needs. Despite a comprehensive, eight-year study by a northern health board which unequivocally determined the exact infrastructure required within every community on the northwest side to deliver quality health care to local residents, political interference at the eleventh hour resulted in the announcement of a huge hospital to be built in only one of those communities, literally abandoning the rest. That hospital now operates as little more than a holding facility for patients destined to be shipped south, while people and health staff in surrounding communities continue to languish in decades-old, moulding clinics. On-the-land health practices, by definition, require a healthy land base in which to take place. However, colonial government policies past and present have systematically displaced Indigenous peoples from their land to make way for industry to enter and remove “resources” such as uranium, trees and oil. Traditional territories have been rendered into sacrifice zones where people who populated it for generations become trespassers on their own lands. Locals have referred to the land as their church, and their hospital, yet we are seeing it increasingly mined and clear cut. Industries bribe Aboriginal administrations into signing so-called 6 “agreements” behind closed doors, which are done deals before the population finds out about them. Subsequent “public consultation meetings” are held, while the industry is already hauling the resources off the land. Uranium companies Cameo and Areva are allowed access to youth across the northern school division, conducting aptitude tests in classrooms to determine suitability for work in the mines. Positions underground and in the mill, the most highly radioactive places, are almost entirely held by Aboriginal youth. Mine workers disclose serious safety breaches in private, but refuse to do so publicly for fear of losing their jobs. Health professionals refuse to conduct comprehensive health studies, apparently because we don’t have a sufficient population base. Regulatory bodies such as the Canadian Nuclear Safety Commission apply the ALARA principle – “As Low As Reasonably Achievable”, and phrases such as “less than severe” and “non life-threatening” to minimalize impact. Public information sessions show slideshows of utopian green cartoon trees growing over contaminated sites, while at the same time reports come in from other former mine sites of contaminated groundwater, plants and even muscle and bone tissues of large game animals such as moose and deer. Generations of families suffer from increased cancer rates, with the only explanation given as “smoking”, even though the cancers are not all originated in the lungs. All the above is strategically supported by existing government policies, and serve to seriously undermine control over our own effective healing in the north. Besides all the aspects of community health, a valuable initiative to re-vitalize would be the Healthy Community networking concept. Health Canada introduced this in the 90’s when the Northern Village of Beauval was offered funding for community development. This included the services of two community development facilitators, training, several community gatherings, funding for a Healthy Community coordinator, and expenses to attend national and international Healthy Community conferences. In cooperation with the local municipal office, the coordinator facilitated networking by community agencies, resulted in many improvements. Regular input from community gatherings surfaced needs for services such as an Addiction centre, Kids First, and Head Start. National networking involved exchange of information with other communities across the country in the project, mostly rural and aboriginal, and the sharing of inspiring ideas. The International Americas Conference was in Quebec City, and reps from each Healthy Community attended. North and South Americas now exchanged ideas and scenarios, and learned strategies and geography. This is a specific example how funding can be used toward community development, with far reaching effects. Almost 30 years later, the Northern Village of Beauval still has its Kids First and Head Start school, and continues to hold weekly Interagency meetings, with the intent of 7 building community through sharing information. National and International gatherings of community representatives could also still result in benefits. Truly effective healing must be led by northerners themselves, with both provincial and federal governments in supportive roles, namely funding long term community-based healing programs and removing barriers created by colonial socio-economic policies. In northern Saskatchewan there is a severe shortage of housing, yet we are surrounded by building material and have an abundance of capable young adults in need of a purpose. What could be more purposeful than constructing your own home, which would then have the added bonus of ownership, pride, and dignity that comes along with it. We need housing policies that allow for communities to set their own standards which address specific needs, instead of being constricted by unrealistic laws and codes. For example, one northern village determined through a comprehensive, bottom-up consultative process, that small (600 square feet) two-bedroom homes with the ability to add on if necessary would be the ideal unit type for their community, which had a large population of young single parents in need of housing. Another example is, to be totally realistic, the whole concept of house insurance should get tossed out the window. Most low income families, or single young adults can’t afford insurance anyway. If the Saskatchewan Housing Corporation is allowed the option of foregoing insurance for its hundreds of units due to the expense, then shouldn’t individual homeowners be given that same choice? Rather than logging companies cutting down timber on our traditional territories and hauling it out of our region, the practice of selective logging for local use could be re-implemented. Each community could be supplied with the equipment required to log selectively and mill the lumber into building materials. Local youth would be trained in energy-efficient construction, including the installation of solar panels, and the necessary trades. Four houses could be heated by one outdoor woodstove, the maintenance of which would also create sustainable local employment. Elders in the community could be cared for in much the same way, with an elders residence also built to be energy efficient and heated with the appropriate number of outdoor woodstoves. Each community should be provided a state-of-the-art medical clinic attached to the elders residence, with the appropriate number of acute care beds. Every community should be provided with the means to administer Level 4 care for its Elders within that community, to allow for ongoing family support. Assisted living for those with addiction and mental health issues is a must in every community. These would also operate according to local policies. To improve infrastructure, communities must immediately be given the means to permanently access a clean water supply. Northern communities are regularly subjected to massive power outages, which could be resolved by implementing local energy sources such as solar, wind and water. Policies affecting small business need to change to support success, for example start-up cost and tax breaks. Locally-sourced food such as wild game and fish should be able to be sold and served in local restaurants, without the hindrance of government regulations. In most of our communities, malnutrition and even starvation are too close for comfort. The dependence on food being shipped up to us is a risk we can no longer afford. The present educational system, in special areas, like the foundations, philosophy and axioms, is not strong in the element of learning for life’s sake. The old and made-irrelevant features of ancient Indigenous world views, based on the pure sciences of interaction with the natural world and its cosmological directive, is hardly a part of the colonial impetus that is today’s meaning of education. The conditioning apparatus of the present system has very little and abiding meaning except for the promotion of a livelihood, which means, the lands/waters destructive companies can have their way, which they have. There is no argument when a very exciting subject matter like nuclear science, bio-tech, and myriad topics, are omitted in classrooms and only “jobs” is being implemented into the learning strategies of curriculum in Native schools. Whosoever has the control of today’s education, also has the control over a people. True to form, what our parents taught us in the camps,, backed up by ancient premises already developed down the ages, is the mainstay of what a learning is, and to be reinforced if such a colonial dictum is to be destroyed. Treatise has been developed by genuinely Indigenous educators which will require careful reading, and have also been placed into practicum. Numerous strategies have been applied with success, but not supported by the present education “system”. Education that is culturally-valued is first and foremost based on respectful relationships. A respectful relationship mutually values the whole person, and recognizes and acts to resolve issues that are keeping someone from being whole, in ways that allow the learner to internalize those ways of retaining and nurturing wholeness. Culturally-valued education preserves, promotes and celebrates the inherent dignity of all cultures, which means removing the lens of colonialism and bringing the true, entire story into focus. In culturally-valued education, it is recognized that all people, Indigenous or not, are colonialized. Relationships cannot be genuine unless they’re founded in the truth and guided forward from there. The truth in Saskatchewan is that it was founded in colonialism. The people who were here before European contact were systematically pushed off their lands to make way for the incoming, starved, discriminated against, and forced to release their children into residential schools. The goal was assimilation, to cut off the normal ability of families to pass on generations of wisdom and skills. The result was genocide, and subsequent generations of dysfunction, grief and misery. Culturally valued education recognizes that grief and trauma erode the ability to learn, therefore prioritizes healing over all. This approach naturally accommodates the adult learner, and doesn’t place a limit on age. Culturally-valued education has processes built in place to give voice to local community and be directed by that. In the last decade, local school boards were replaced by “community school councils” which, although democratically elected, have virtually no say in things such as budget and hiring, disciplining and firing. Policy needs to change back to empowering the community in the education of its youth. Culturally-valued education is not subsidized by industry that has a vested interest in recruiting students into its production. Northern Lights School Division spans the entire northern half of the province. Cameco and Areva are regularly allowed into NLSD gymnasiums to promote uranium mining, and into classrooms to administer aptitude tests measuring students’ suitability for work in the mines. Students are told, sometimes even by teachers and school administrators, that their purpose in graduating is to “get a good job in the mine”. Elders in the school are warned not to discuss nuclear waste with the youth. Career Fairs are paid for and almost entirely represented by uranium corporations. Our education in the north has truly become corporatized. Our youth deserve better. We are in great need of a diversified economy and “Green Career Fairs” to reflect that. The entire provincial middle years and high school science and math curriculums have been revised to take on an industry focus. Culturally-valued education would consistently foster critical thinking, instead of applying tunnel vision. The current provincial government has drastically cut school budgets, resulting in a loss of staff and support services for the most vulnerable. Policy must be immediately revised to not only restore but monumentally increase the ability of our schools to operate independently from industry, and serve the needs of our youth to first heal. One of the most serious barriers to health, wellbeing and learning in a region that has been long recognized as having high poverty rates, is the cost of food due to the high cost of transportation. People of the region have always been dependent on the availability of local wild foods from the land, lakes and rivers. The advent of more roads and development, and the effects of climate disasters, has hurt the health and numbers of fish and game. More and more people have had to depend on stores. It is ludicrous that we are burning fossil fuels to transport imported food when we could be developing local food sovereignty. More training in growing food and maintaining greenhouses would go a long way to eliminating both carbon emissions and would benefit the entire population. It could also provide a source of healthy, local and sustainable employment that people could take pride in. Climate instability is going to wreak havoc on imported and domestic food crops. It is time to be realistic about creating food sovereignty in every community. It is a sad truth that people are literally only weeks away from starvation when food security is achievable. Despite huge tax breaks for corporations and pitifully low royalties, government policy continues to hold us hostage to putting all our eggs in one basket, instead of promoting true prosperity within northern communities. Most people must travel hundreds of kilometers to shop for essentials or access health services that are taken for granted in the south. A community needs and resource assessment would shed light on ways that a locally sustainable, diversified economy would better offer employment in a wider range of fields and careers, and make better use of resources. Families would not be subjected to absentee parents who are required to be away from home, and would be less stressed. Money would circulate within the local area, rather than always leaving the community. Northern Saskatchewan was once a beautiful, pristine, green forest, with clear lakes, rivers and streams so fresh we never had any concern about taking a drink of the life-giving water. Wildlife was abundant; fish, moose, caribou, ducks and berries provided healthy sustenance. Medicines from the plants prevented and cured illness and injuries. Over the last 60 years, uranium mining in the Athabasca Basin and nickel mining in the northeast have left permanent scars and serious chemical, heavy metal and radioactive contamination impacting the land, air, water, plants, animals and people. Even with today’s so-called “best practices” and “technological advances”, industries have to admit they fall short in ensuring that mine sites, watersheds and surrounding land will be left clear of contamination. In the case of uranium mines, there are already several permanent sacrifice zones that have been harming the health of animals, plants and people. It is also known to have intergenerational effects, reducing the ability to thrive. It is imperative that the Saskatchewan government and its industry partners take on the responsibility for restoring all impacted areas to an un-contaminated state that will continue to be safe for all generations to come. It is their responsibility, since they did not heed the warnings given by the Dene Elders to “leave the black rock alone”. If this cannot be accomplished, then no further uranium mines and other mineral and gas development should be permitted.